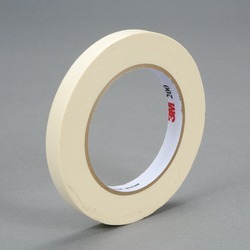 3M™ Paper Tape 200 has good instant adhesion that sticks to a wide variety of surfaces and helps reduce labor. Provides good holding power to help resist lifting or curling. The crepe paper provides conformability for easy handling and application. Is easy and tearable, yet resists slivering. Special backsize treatment provides easy to use controlled unwind. It is not recommended for paint masking, but may be used for non-critical applications. It is designed for indoor use only, and should not be subjected to outdoor or UV exposure. Uses solvent free manufacturing process. 3M™ Paper Tape 200 is a utility purpose paper tape for holding, bundling, sealing, non-critical masking tape and a vast number of other jobs where a pressure-sensitive tape is needed. Transportation, aerospace, automotive, commercial vehicle, RV, bus, truck, ship yards, military, metal working, furniture, electronics, solar, trailer manufacturing and woodworking. Sealing, holding, bundling, reinforcing, identifying, tabbing, wrapping, paint masking, splicing and protecting.